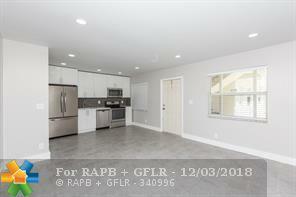 Extensively remodeld and ultra modern two bedroom one bath first floor condo unit with private back patio. Brand new a/c compresssor and air handler. Newer hot water tank. New White PVC fence for patio areas. This unit was redone from top to bottom, all brand new stainless steel appliances, high end countertops and cabinets. Framless shower door on large walk in shower, new vanity. 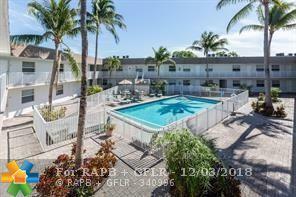 Complex is fenced and has a large courtyard pool area. Community laundry rooms. Investors can rent right away, LOW MAINTENANCE INCLLUDES RESERVES. 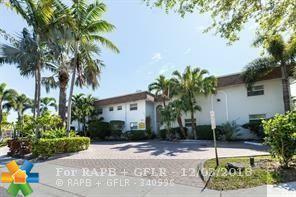 Great location near Wilton Manors and the Galleria. MInutes to the beach. ALL AGES PET FRIENDLY. This listing is courtesy of First Colonial Realty.